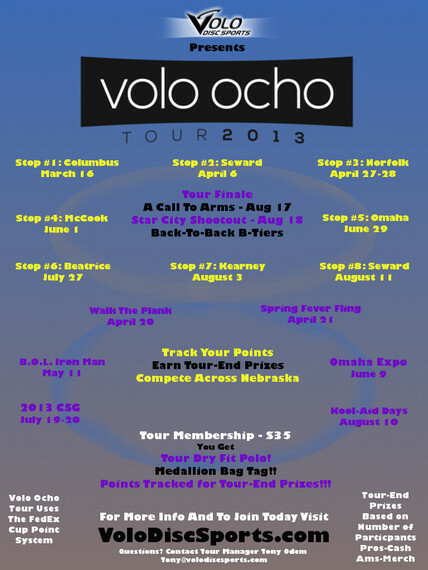 The first statewide tour hosted by Volo Disc Sports is the Volo Ocho 2013 Tour. Competitors register for the tour to earn points at each of the 16 tournaments played in 12 different communities across Nebraska. Point calculations vary depending on the tournament, some tournaments have a higher points value. In addition to prizes for point totals members are to receive a tour shirt and bag tag for $35. The Flyer is the printed newsletter from the Lincoln Flying Disc Club about disc golf in the region. Select a link to view the pdf document. Thanks to Kim Theesen for scanning the old newsletters and creating these PDFs.